The Welsh Government has been criticised for not deciding whether to require an environmental impact assessment of a controversial incinerator. 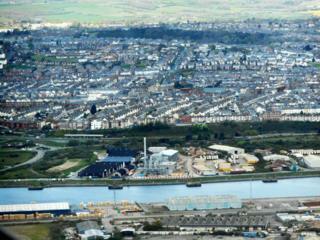 It said a year ago it was "minded" to order an assessment of the power plant in Barry, Vale of Glamorgan. Conservative AM Andrew RT Davies said it's "farcical that this situation has been allowed to drag on for so long". The minister in charge said a decision will be made "as soon as possible". The biomass power plant, which has faced vocal opposition from residents and local politicians concerned about potential pollution. will burn waste wood at high temperatures, in a process called gasification, to generate electricity. It was granted an operating permit by Natural Resources Wales in February last year. Environment minister Hannah Blythyn wrote to the developer on 14 February last year stating the Welsh Government was "minded to direct that an environmental impact assessment is required". Questioned by Mr Davies in the Senedd on Wednesday, Ms Blythyn said "further legal clarification on aspects of the case has been necessary. "I understand the Member's frustration with this and why he is pushing on behalf of his constituents, but I'm sure he agrees, on an issue such as this, it's important that things are done and that we get all of the best legal consideration that we can have to make sure that we come to the best decision, and a decision will be issued as soon as possible." Image caption Hannah Blythyn is still the minister responsible for the decision despite First Minister Mark Drakeford moving her from deputy environment minister to deputy minister for housing and local government in December. Reality check: Can we be self-sufficient in renewable energy? The site has not yet begun full operations, but is in the final commissioning phases. According to Natural Resources Wales, the phase now underway, "cold commissioning", involves further testing to ensure each part is operating and working as expected. At this stage, it does not involve the use of wood as fuel. "In the next couple of months, we expect the site to continue from the cold commissioning to the hot commissioning phase. This will involve the gradual introduction of wood to the plant to begin the main operations," said a spokeswoman. The Vale of Glamorgan council granted the original planning permission. The privately-run venture is backed by Aviva Investors, who have said that "all emissions pass through a pollutant control system to ensure they are within the limits required by the emission limit values specified in the Industrial Emissions Directive and are safe for release into the atmosphere."